Cover bottom of a medium heavy-bottom pot with your everyday olive oil. Turn heat to a gentle medium. After a minute, add the onion, carrot and celery. Cook, stirring often, for ten or so minutes, until veggies are soft but not browned. If they threaten to turn brown, turn heat down a little. Add the garlic and the paprika. Cook, stirring, until garlic perfumes the air, a minute or so. Add the peas, stir to mix with the veggies. Add the water or stock; bring to boil; cover; turn heat to low; let simmer. As the peas cook, check them every few minutes. If they seem on the verge of drying out, add some hot water or stock. While they’re cooking, chop about half a bunch of parsley or several arugula leaves for garnish. The peas should be done in about an hour, maybe a little less. They are ready when they are very soft. When they are done, add a vigorous twist or three of black pepper, and taste. Stir in a teaspoon of salt. Now add a small amount of acid—a teaspoon or so lemon juice or vinegar. You don’t want it to taste lemony or vinegary; you just want the acid to balance the flavors. Taste again and adjust for salt, pepper, and acid. More smoked paprika could be added at this stage if you want. 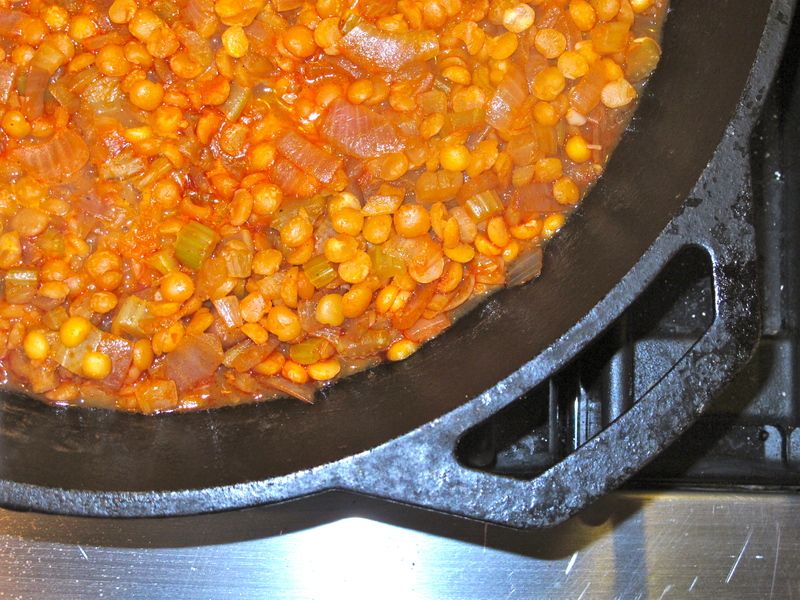 To serve, ladle into warm bowls over brown rice or toasted crusty bread. Drizzle with the best olive oil you have—this dish will showcase its flavor—add a dash of crushed chile flakes, and a good sprinkle of chopped greens.